There are certain restaurants, boutiques or patisseries that many people think of when you think of Paris. 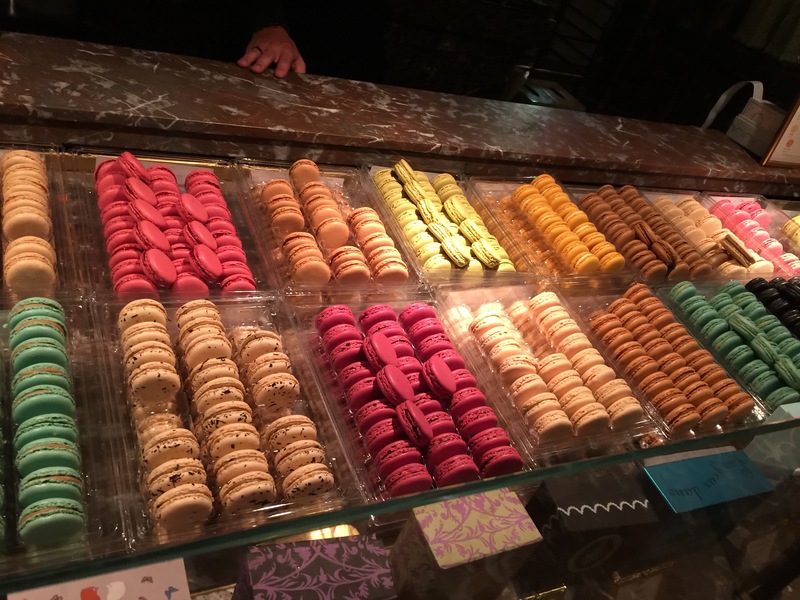 There’s the famous Cafe de Flore in Saint Germain, there’s the Moulin Rouge, there are famous sidewalk cafes in the Montmartre, and then there are the famous French macarons. When one talks about French macarons in Paris, inevitably, one patisserie comes to mind where the baked goods, including the macarons are served up in boxes of a light green-blue color that’s almost as iconic as the Tiffany blue box. Laduree is famous the world over for its pastries and baked goods, but especially for its French macarons. Today, Laduree boutiques can be found the world over, not just in Paris, but Paris is where the Laduree story begins. In 1862, the Laduree family opened up a bakery in Paris. 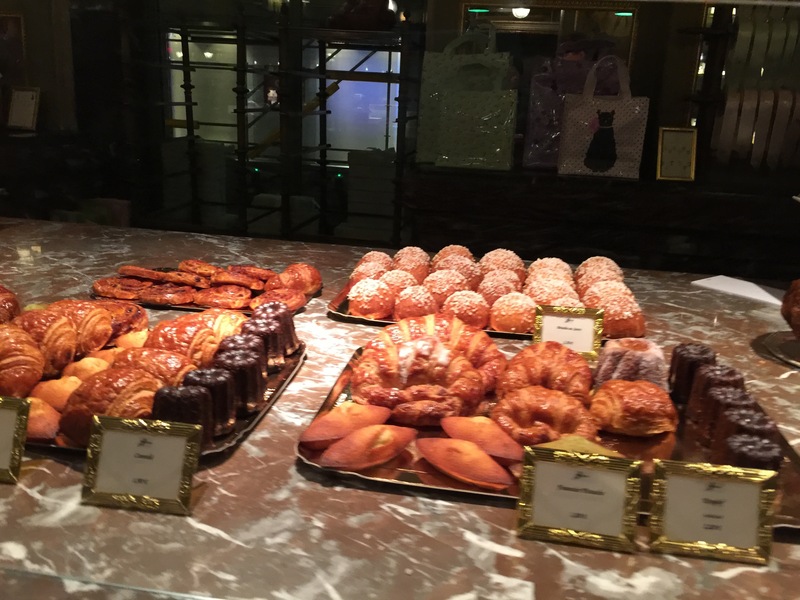 After a fire that destroyed the bakery’s kitchen in 1871, Laduree reinvented itself into a pastry house whose decoration and design was entrusted to a famous artist and poster artists who helped transform the Laduree name. Today, the Laduree name is synonymous with French macarons and French pastries. As iconic as the name Laduree is the macaron tower. As soon as you step into the Laduree store on the Champs Elysees, you’re greeted by French macaron towers in all sizes, from small 5 tier towers all the way to gigantic 13-tier towers. Made solely of macarons and a little bit of frosting as “glue” to keep the macarons sticking together, these macaron towers are as classy as they are tasty and unique. You know I couldn’t go all the way to Paris without stopping at Laduree to try some of these amazing French macarons for myself. Much to my husband’s chagrin, I dragged him into the pastry shop to see what all the fuss was about. 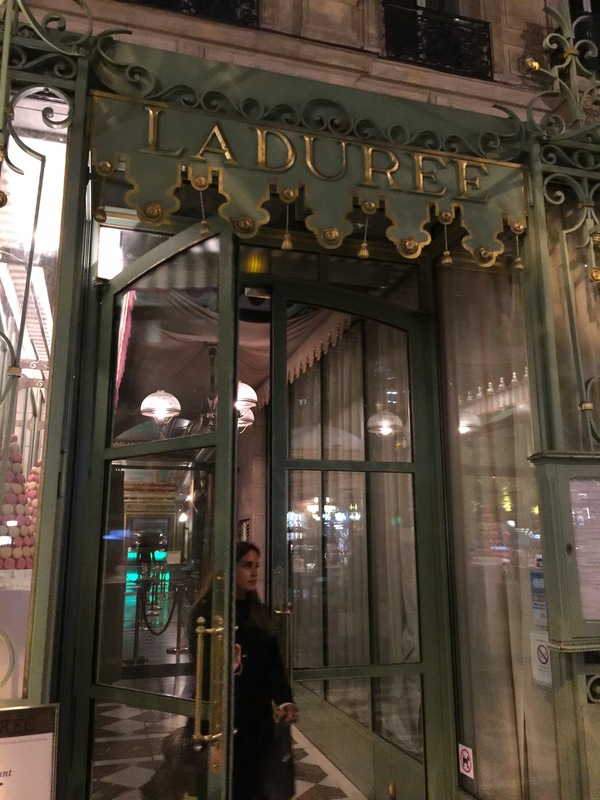 While Laduree is known for its French macarons, it is also a full-fledged patisserie and candy shop. There was a whole display of boxed meringues in various flavors from raspberry to chocolate to mint. And Laduree even sells its own line of coffees, teas and bottles of Laduree champagne for those special occasions. There’s also baked goods. The traditional croissant or pain au chocolat, better known as a chocolate croissant in English. Or there’s homemade madeleines and mini chocolate bundt cakes. You could stock up for your morning pastries here. But we came here for the macarons and that’s all I was looking for. The macarons are Laduree’s number one selling item, and with their colorful display of various flavors, its easy to see why. 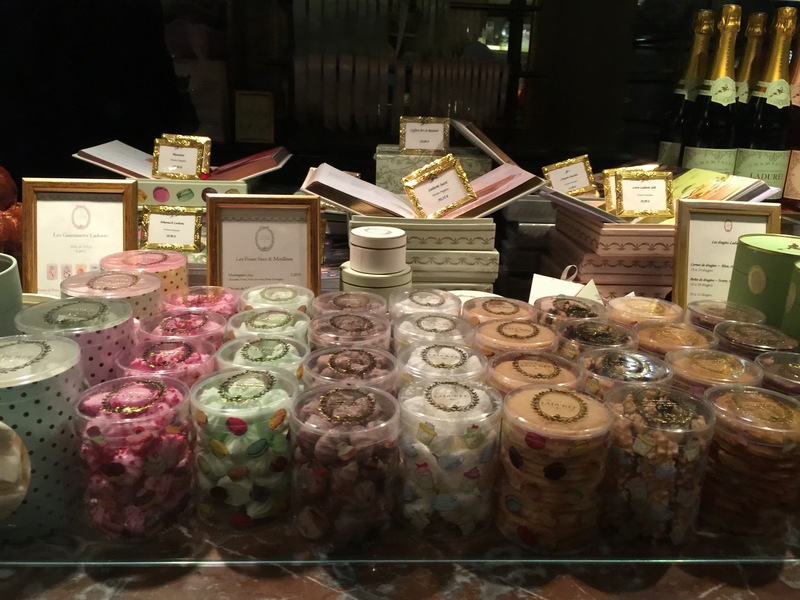 At the shop, the day we were there, Laduree was offering 17 different flavors of macarons. 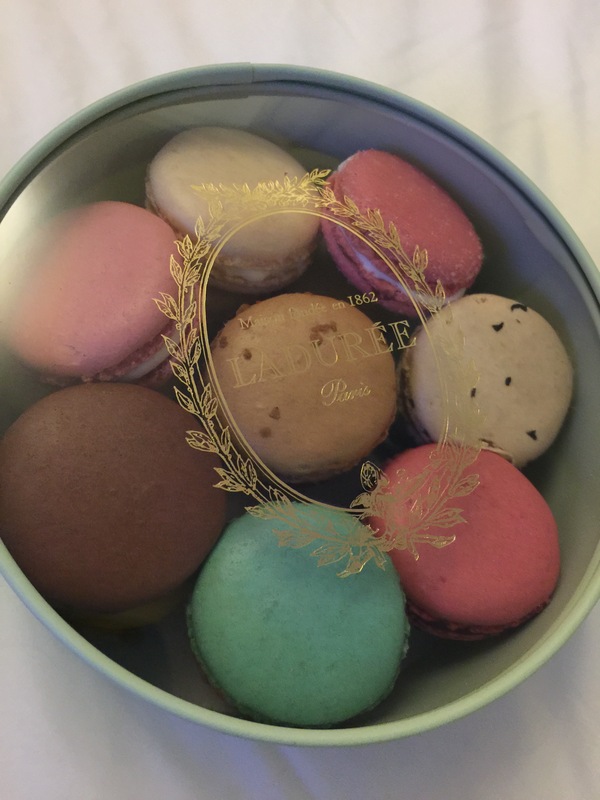 As we were going to be taking these in a box to enjoy back at the hotel, the sales associate told us that a small box of macarons could easily fit 15 macarons. So, we decided to make a box of 15, one of each of 15 different flavors, leaving 2 flavors out of our box. After perusing through the flavor selections, we decided to leave licorice and iced mint out of our box. The box we took home included lemon, pistachio, rose, orange blossom, coffee, chocolate, caramel banana, raspberry, maple syrup, date fig, Marie-Antoinette tea, salted caramel, vanilla, coconut and strawberry candy. I was hoping there would be a passion fruit flavor so we could compare it to what we had at Pierre Herme and La Maison du Chocolat, but that was not to be. The macaron’s were good, but not great. The macaron cookie itself had a nice crunchy shell, but it was missing the body inside the shell that was nice and soft and chewy. So, the cookie was almost more like eating meringue than a macaron cookie. The ganache filling between the macaron cookie was delicious and flavorful, but when you put together the whole package, I think that I was expecting a bit more from the macaron based on the reputation of Laduree and therefore was a bit disappointed. I’m not saying that the macaron wasn’t delicious, but it also wasn’t the best macarons I had during this trip to Paris. 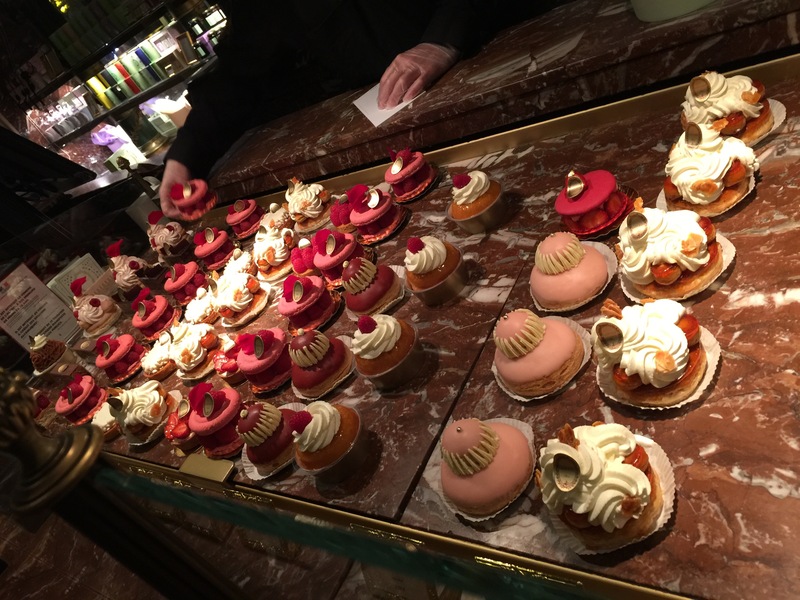 Just before we reached the cashier to purchase our box of macarons at Laduree, we saw a display of some more sizable pastries and my husband couldn’t resist picking up a little something for dessert back at the hotel. These pastries looked delectable and were essentially large, ornate macarons. Most of them used giant macaron cookies and exaggerated fillings to create these amazing pastries. My husband chose a giant raspberry macaron pastry. It was made with two big raspberry macaron cookies filled with raspberry ganache and fresh raspberries, and then topped by a pretty red rose petal and a Laduree chocolate piece. My husband said this was fantastic, the cookie was exactly as it should be, crispy and crunchy on the outside, and soft and chewy on the inside. The fresh raspberries were delicious and tasty with the raspberry ganache. This is the type of macaron cookie we wished was replicated on the smaller macaron cookies we purchased. 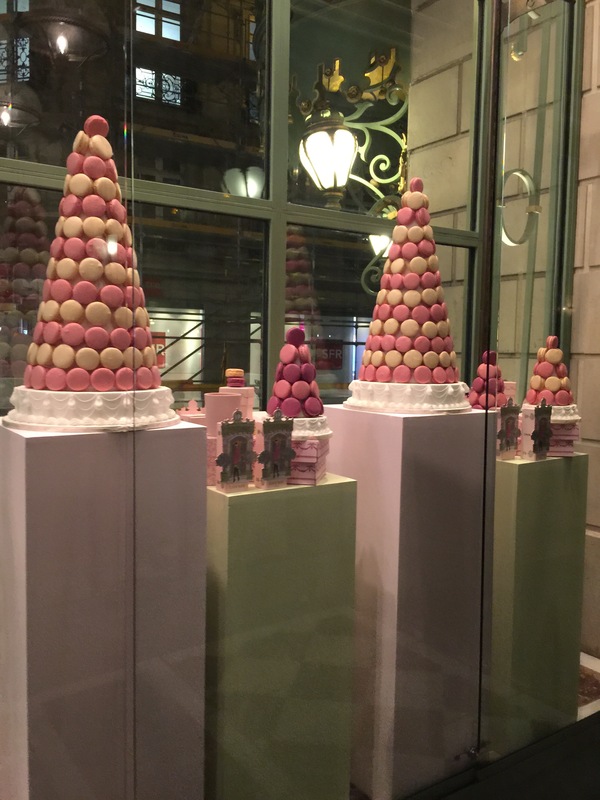 While looking at the gorgeous macaron towers on display at Laduree are mouth-watering, I’m not sure that the reputation of this patisserie lived up to its reputation. Being the most well known, and most popular macaron shop in Paris, I guess I had high expectations for how amazing these macarons should be, or perhapsI was so spoiled by how delicious the macarons at Pierre Herme were that I expected Laduree to be so much more. 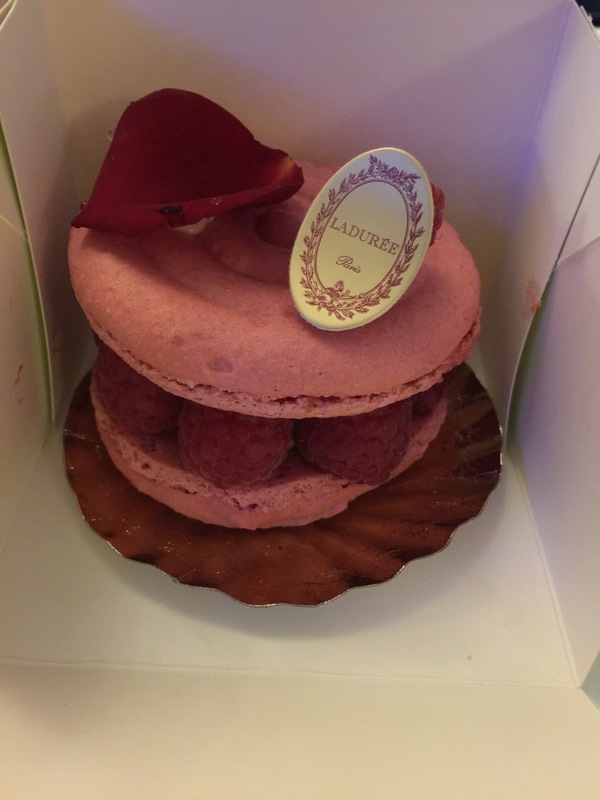 It’s not to say that Laduree wasn’t delicious, this is just to say that it just wasn’t as good as I had expected it to be and I had just built up their reputation so much that I had expected more. The dancer of being so well-known, its hard to live up to that reputation.